Not all carbohydrates are healthy, and choosing the right type of carbs to include at your meal can help you lose weight more easily. Refined and high-glycemic carbohydrates, such as potatoes, white rice, breads, sugar, desserts and most breakfast cereals, can disrupt your blood sugar levels, which can stimulate hunger and cravings within a couple of hours after your meal. 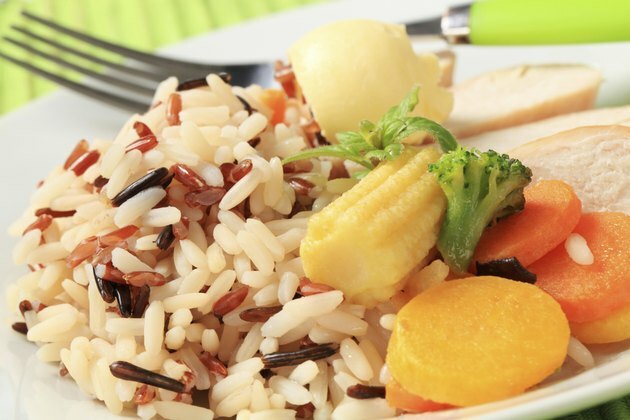 Choosing unrefined and low-glycemic carbs, such as nonstarchy vegetables, sweet potatoes, quinoa, old-fashioned oatmeal, fruits and legumes, can help keep your blood sugar and energy more even between your meals so you are not tempted to eat foods that could interfere with your weight loss. The amount of carbohydrate that you can include at your meals to facilitate weight loss depends on your individual tolerance to carbohydrates. If you have diabetes, have struggled with your weight in the past or carry a lot of your excess weight around the middle, keeping your carb intake low is probably best to allow you to lose weight, as explained by researcher and dietitian Jeff S. Volek in "The Art and Science of Low Carbohydrate Living." If you have a low tolerance to carbohydrates, keeping your carb intake to below 15 to 30 grams per meal will give you the best results. Nonstarchy vegetables are your best option to get the carbohydrates, fiber and other important nutrients your body needs, while fruits, yogurt, nuts, legumes and grains should be consumed in controlled portions. Protein is important to promote satiety and make you feel fuller for longer periods of time, according to the May 2008 issue of the "American Journal of Clinical Nutrition." Each of your meals should include a serving of fish, shrimp, pork, beef, chicken, eggs or cheese. Not only is protein important to prevent you from going hungry while losing weight, but it can also help you preserve your lean muscle mass to ensure that the weight you lose is fat and not muscle. The right combination of carbs and protein to help you lose weight needs to be individualized. Fat should not be forgotten and is also important to include at each of your meals. A serving of carbs from nonstarchy vegetables, such as kale, cauliflower, zucchini, tomatoes or onions, with 4 to 6 ounces of protein and 1 to 2 tablespoons of fat, such as butter, olive oil, avocado or coconut oil, is a good place to start for most people. Monitor your weight loss progress and tweak your carbs, protein and fat ratios until you find what works best for you.